On HBO, Westworld (Free) went from a near future amusement park you could live out your innermost desires, especially if they were of the NSFW variety, to a dystopian hellscape where self-aware sorta robots were slaughtering the guests. In other words, running it is definitely not something you’d want on your resume. Neither is stealing the code from Fallout Shelter to make this game, which is something that Bethesda has accused the devs of in a new lawsuit, but hey. On the other hand, the Westworld mobile game from WB Games and Behaviour Interactive is all about seeing how well you could manage the park (and we’re keeping that singular for now, because there’s been no sign of Shogun World or The Raj just yet). It’s positioned as a Delos simulator, where you show your stuff on a virtual facsimile of Westworld in order to show whether like Peter Gibbons of Office Space, you’re a straight shooter with upper management written all over you. Theresa Cullen is still alive in the game, and she helpfully shows you around when you play through the game’s tutorial. But let’s say you could use an even more in-depth guide and you don’t want to wonder if the person doing it is human or host. We can help with that. Let’s blow through the Maze and open the Door, uploading all the Westworld tricks, tips and cheats we can find. What the Heck Are You Supposed to Be Doing in Westworld Anyway? At its heart, Westworld is a time management simulator. Your primary goal is to ensure that the guests visiting the park are kept happy, as each of them comes looking for something: romance, the thrills that come from gambling or gunfighting, the chance to commit crimes with no repercussions, etc. You help them by matching the guest with a host who specializes in what they seek. The closer the match and the better your host is in that particular area, the happier the guest will be with that interaction, and after a certain amount of time has passed, you’ll earn rewards that include common currency, XP for both your host and your player account, and sometimes more. There’s more to the game, including a bunch of narrative elements that you unlock as you meet certain objectives, but it’s going to be wash, rinse, repeat on the basic guest interactions a whole lot while playing. When picking a host to send to help out a guest, the first thing you’ll want to look for is the specific role said guest wants to have fulfilled. These appear as icons above their head with a symbol inside and a colored border. For example, the Con Artist role looks like a mask and has a light green border. Ideally, you’ll want to find a host from your roster who has the Con Artist role as well, but in a pinch, you can also use one who has any related role with the same border color. Staying with the same example, the Gambler is a related role, though it’s not a perfect match and won’t make the guest quite as happy. The guest will also have a value attached to their role, and only finding a host with an equivalent or higher value will lead to the best interactions. Along with reduced rewards for neutral interactions, the guests will actually shoot and “kill" your host if they are too unhappy (this is Westworld, after all), so it behooves you to get the best possible match. On top of that, the guests have either white hat, black hat or neutral tendencies, so you can get the best rewards by matching the right hat color plus role. Once you’ve set your interaction, there’s nothing to do but wait. Actually, that’s not true, because you can use Gems, the game’s premium currency, to finish an interaction instantly, but mostly this is timer juggling as you like it. Hosts come in rarities ranging from one to five stars as you’ve undoubtedly seen in many a previous mobile game. Any host can become a better one because after they reach max level, you can visit the Rebuilds lab and sacrifice the same number of equivalent hosts as their rank to bump them up a star. That is, it takes one 1-star host to bump another 1-star host up to two stars, two 2-star hosts to promote one from 2 to 3-star rank, and so on. Still, while the rank and file hosts are great and you’ll definitely need plenty of them, the good stuff is the 4 and 5-star hosts, who tend to be the ones you see on TV. Except for Teddy Flood, who starts out at the 3-star level. Poor, poor Teddy, dyer of 1,000 deaths. 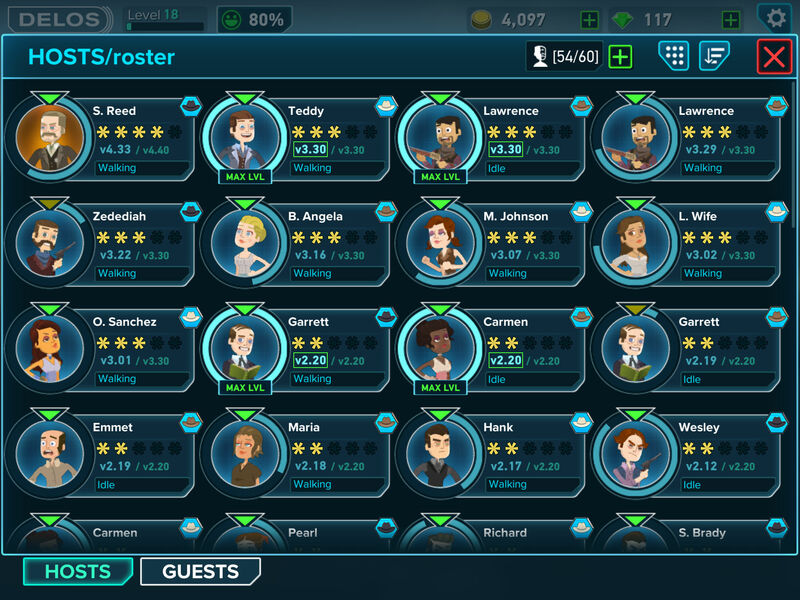 Anyway, if you want to eventually have Dolores, Bernard or Maeve on your roster, the normal ways of earning host codes and then cranking out hosts isn’t going to cut it. 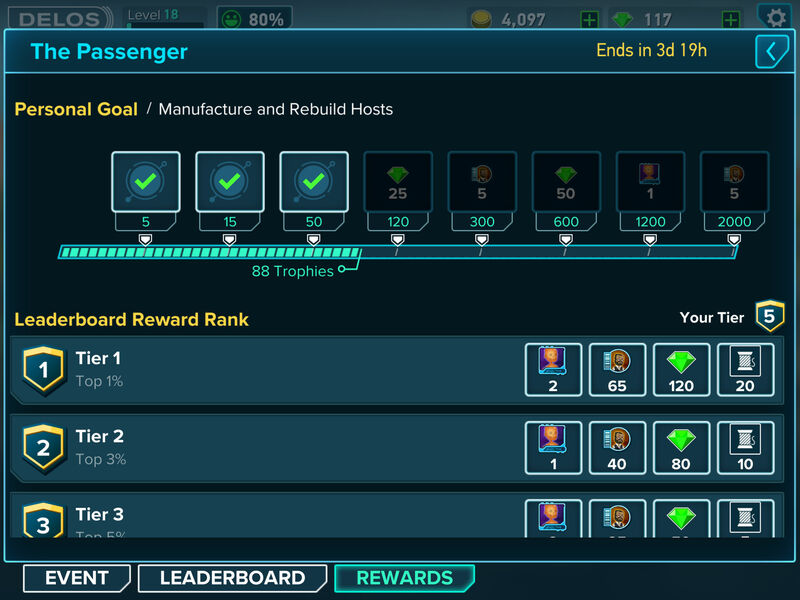 There are basically two ways of obtaining rare hosts. One is to spend 250 Gems on an aptly named Premium Host Code. This will guarantee you at least a 3-star host, which you’ll get 90.1 percent of the time (we looked it up). You also have a 9.3 percent chance of getting a 4-star host and a 0.6 percent chance for a 5-star host. As Jim Carrey said in Dumb and Dumber, “So you’re telling me there’s a chance? YES!" The longer but more exact way of building a rare host is to collect their code fragments. 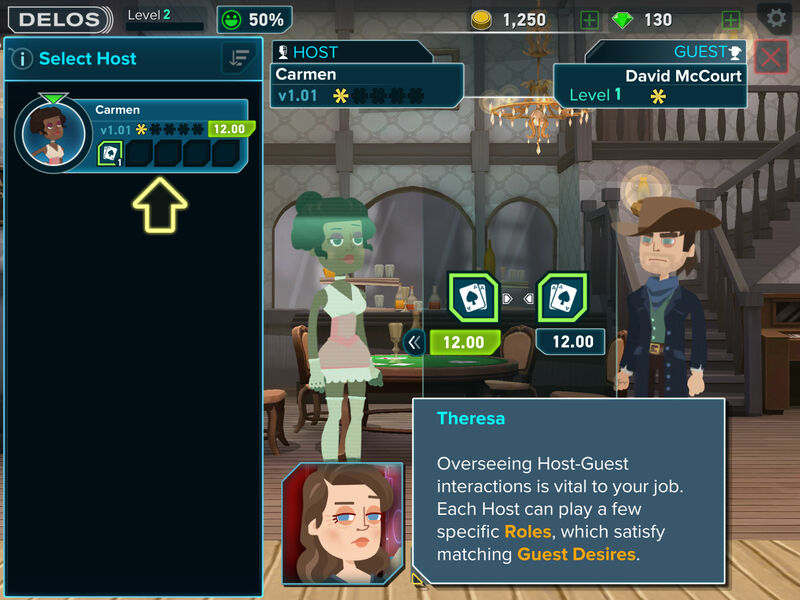 Another staple of F2P mobile games, the fragment system allows you to save up for specific rare hosts, such as the 5-star Bernard or 4-star Dolores (she’d probably be ticked she’s not 5 stars, by the way). You can find fragments in the game’s events, which rotate regularly so you’ll have to keep your eye on what is active at any given time. You can find the active events by tapping on the trophy icon on the left side of the main game screen. Bonus tip: Events have both milestone and rank rewards, so if you’re trying to earn specific code fragments, definitely keep pushing forward until the very end of the event for the best combination of rewards. Anyway, coins are necessary for many things that will make your like better, including building new structures in the game’s various locations and upgrading the ones you have, producing new hosts and upgrading the Delos facilities. The most reliable way to get more for free is simply to grind out more guest interactions. 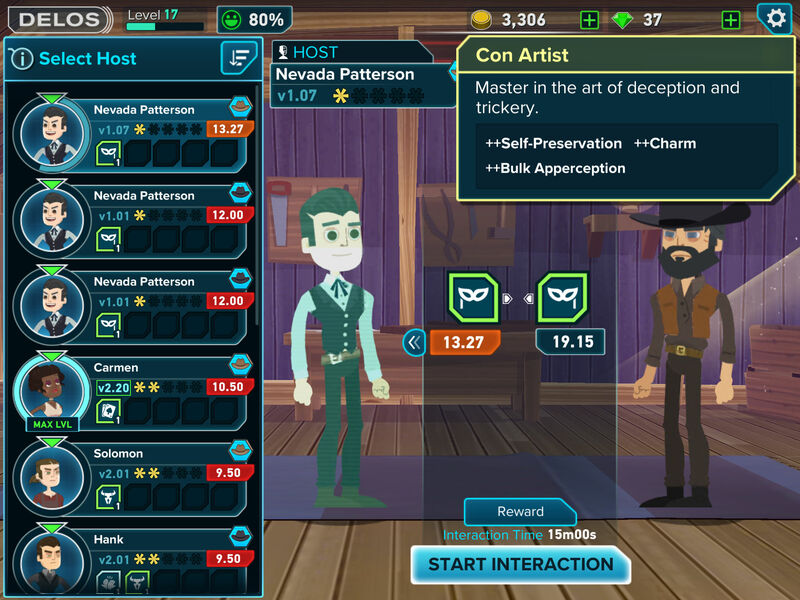 Longer and higher level interactions tend to yield more coins, but even the saloon in Sweetwater can be used to pump out coins if you simply resolve yourself to firing up new interactions as soon as the ones in progress are complete. 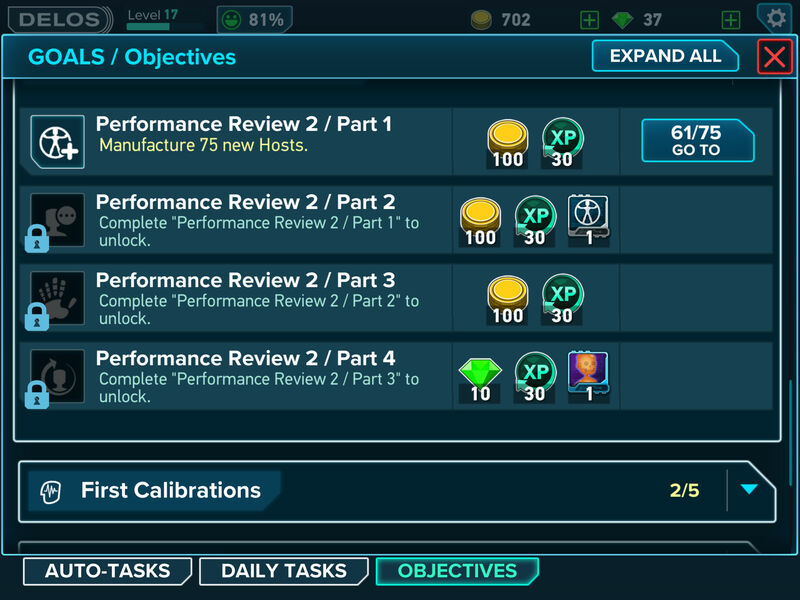 You can also earn coins for completing daily goals and longer term objectives, which you’ll find by tapping on the checklist on the right-hand side of the main game screen. Gems are a little harder to come by, as befitting of their premium currency status. Most often, you’ll want to save these for either Premium Host Codes or the special deals that pop up in the store from time to time, but they can also be used to speed up just about any in-game timer. Other helpful uses for Gems include increasing the number of slots that can be active at any one time in some of the Delos facilities and increasing the maximum number of hosts you can have on your roster. The easiest ways to earn free Gems are by leveling up and completing objectives, though not all of the latter yield Gems as part of their rewards. It really wouldn’t be a proper Westworld game if there wasn’t a chance for the hosts to go on the fritz, and this is represented by perhaps the game’s most annoying mechanic, the possibility that your hosts will glitch. The more often you use a host, the higher its chances that it will glitch, which you can see simply by tapping on its profile. The ‘Glitch Risk’ tells you the exact percentage that the host will glitch during its next interaction. 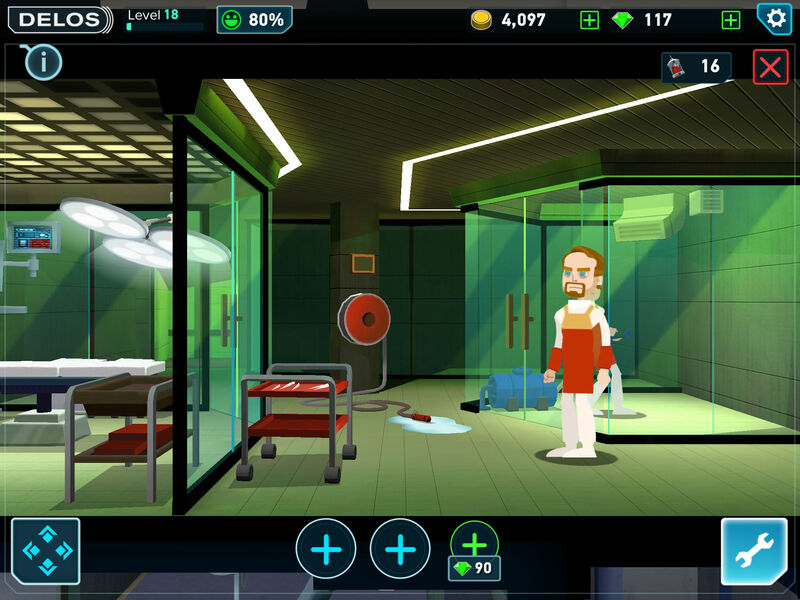 If a host glitches, the only way to get it back in service is for it to spend an extended stay in the Diagnostics lab — where you’ll be tempted to spend Gems to speed up the timer, thus falling directly into the teeth of the game’s F2P loop. It’s highly preferable to avoid this by sending hosts to Diagnostics before they glitch, as the timer for preventative work there is much shorter than it is when they are broken. Our advice is to spend some Gems on increasing the number of Diagnostics bays to at least four or five, because while only one host can be worked on at a time, you can queue them there and all will go through a check-up in order, even if you are logged out of Westworld. Then, keep an eye on who needs to be sent to the lab by opening up your roster of hosts (that’s the top icon on the right-hand side of the main screen, where you can also take a look at all the guests in the park) and looking at the triangle icons over their heads. See any of them blinking? Those are hosts with increased glitch risks at the moment, and should probably be sent to Diagnostics before the inevitable happens. Speaking of the inevitable, because this is Westworld and all the guests have guns, they’re going to get upset at some point and shoot up one of your hosts. Probably more than one. That’s not the end, though, because as Teddy Flood can attest, you can just patch up the hosts and send them right back to work. The thing is, you’ll need to do some prep work first. 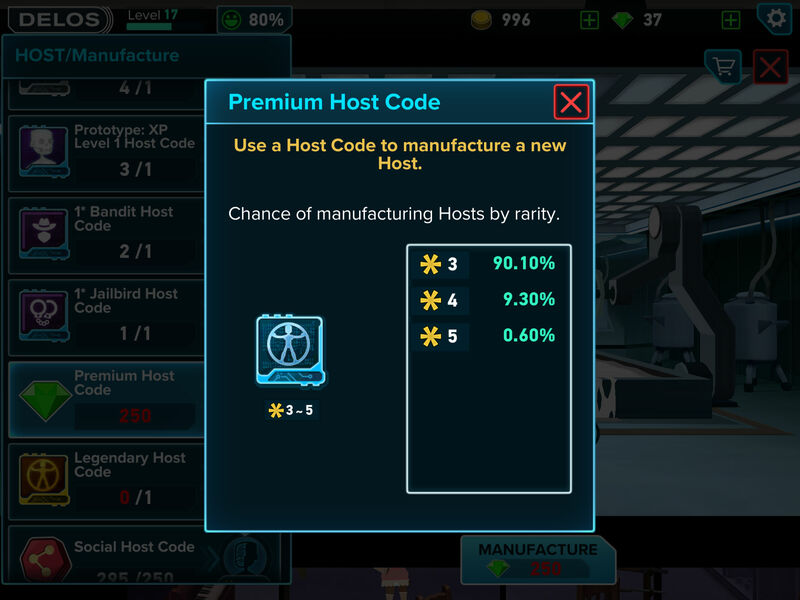 Repairing dead hosts requires units of a resource called Synth-Blood — as few as five units for a 1-star host and more for rarer hosts. Synth-Blood can be manufactured in the Biomaterials lab, and all it costs you is coins and time. When you have some Synth-Blood on hand, you can head to the Body Shop and find Felix and Sylvester from the TV show ready to get your hosts in working order again. Simply tap on one of the slots at the bottom, choose the dead host you want brought back and if you have the resources, they’ll be good as new after the proper timer expires. Next PostNext SwitchArcade Roundup: ‘Mario Tennis Aces’, ‘Sonic Mania Adventures’ Episode 4, and New eShop Sales!